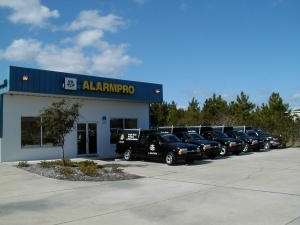 State Licensed, Alarmpro is Flagler County's ONLY LOCAL alarm company serving Flagler, St. Johns & Volusia Counties for over 27 years. Located at 31 Enterprise Drive you are welcome to come into our office to pay a bill, make account changes, have your questions answered or just visit our office cats. Under the same ownership since 1990, Alarmpro has grown with our community starting with just one client to over thousands. As a full service alarm company, we provide sales, service, installation & monitoring. Blended with excellent service, Alarmpro believes in providing quality equipment & workmanship. All our employees are professionally trained to handle your security needs. Mention PalmCoast.biz and receive your first month of monitoring at NO CHARGE when you let Alarmpro monitor your existing system. ($22.00 Value). Top of the Line - Highly Recommended I used Alarmpro for about 4 years and decided to search for a nationwide lower price monitoring solution. I found one, informed Alarmpro of the cancellation and moved to the new company. Alarmpro handled it very professionally from start to finish. One year later, after many problems with my "lower priced" monitoring, I realized what I had with Alarmpro. Was I paying a little bit more? Yes. Was I getting a lot more for my money? YES! I could not be more pleased with Alarmpro and their staff. They got me setup with a reactivation within 18 hours and once again handled everything professionally. I will continue to recommend Alarmpro to ANYONE who is interested in monitoring their alarm system. Unlike other companies, Alarmpro monitors much more than just burglary signals (such as phone line issues, low battery, etc). With Alarmpro monitoring my system, I feel as if everything is covered and don't need to worry about anything. Thank you Alarmpro! Top of the Line - Highly Recommended Great to work with! Showed up on time, completed the work as stated, and they are locally owned, you can't ask for much more than that. Top of the Line - Highly Recommended Excellent customer service. Glad to know I can go to the office and meet the people I deal with on the phone including the owner. Top of the Line - Highly Recommended We moved into our new home in 1997 and it was prewired by the builder for an alarm system. The builder recommended Alarmpro and I have been a customer (monitored system w/ service contract) ever since. Norman Mugford worked with us to implement some custom applications and the service has always been excellent. Top of the Line - Highly Recommended Very good service would use again. Highly recommended.